Michael Dawson joins me to discuss his new book “Mashmaker” as well as the emergence of some unique craft beer malts. Today my guest is Michael Dawson from BSG. Michael is the author of the new book Mashmaker, and founding member of the original “Brewing TV”. Michael is an editor for BYO magazine, BJCP certified beer judge and writes for the “Growler Magazine”. He just published his new book “Mashmaker – a Citizen-Brewer’s Guide to Making Great Beer at Home”. We start with a brief discussion of what Michael has been up to since last appearing on the podcast. 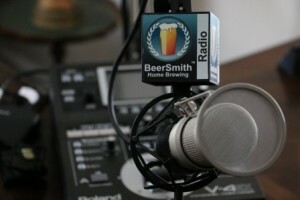 We discuss the main topic for this weeks’ show: malts and craft malting. Michael starts with a description of the basic groups of malts and how they are used. He explains the malting process and how the four major groups of malts are malted and then kilned. We talk about barley varieties and how a few major barley varieties dominated the US market for many years. Michael explains heritage malts, many of which disappeared over the last 100 years, and how some growers and malsters are trying to introduce long lost malts to the craft beer industry. We discuss a few specific heritage varieties that are now available to home brewers: Crisp Plumage/Archer and Crisp Chevalier. Michael tells us about his experience brewing with heritage malts. We discuss the concept of “terroir” and how the flavor of a malt reflects the region it is grown in. Michael shares one malt specifically grown in Northern Italy as an example: Weyermann Eraclea Pilsner. Michael gives us his thoughts on craft malting as well as small barley farms that are driving a “buy local” trend in beer ingredients. We spend a few minutes at the end talking about his book “Mashmaker” and Michael shares a few of the stories in the book that go with his many beer recipes. Michael shares his closing thoughts on completing his first brewing book. Thanks to Michael Dawson for appearing on the show and also to you for listening!